India Pakistan relations have always been mired with in various controversies, which have been preventing the friendly relations with our neighbor, who in ‘popular perception’ is seen as anenemy. It is due to this that while all the members of SAARC countries have been invited, the one to draw maximum popular attention has been the coming of Nawaz Sharif, the Prime Minister of Pakistan. In a deft move India’s the then Prime Minister designate sent an invite to all the heads of SAARC countries for his swearing in ceremony, (16 May 2014)which was held with great pomp and show. Nawaz Sharif faced lots of obstacles in accepting this invitation. His family, his daughter included, tweeted and called for acceptance of the invite, she argued as to why India and Pakistan are living in a hostile situation like North and South Korea, why can’t they live like the countries of European Union. She was actually echoing the sentiments of most of the Pakistanis who want the strengthening of democracy in Pakistan and good relations with India; she articulated the aspirations of Pakistan’s majority for whom peace with India is synonymous with the path of good democracy and development. In my own visit to Pakistan a couple of years ago I was overwhelmed with expression of longings of Pakistanis for friendship with India. This also gets reflected in their warm gestures in welcoming you, and showering the best of hospitality on you. The major obstacles in Pakistan to the peace with India come from the strong army and the Mullah alliance. This time also as the Modi invite was in the pipe line the terrorist attack took place on Indian Consulate in Afghanistan, in Herat. The Hafiz Sayeeds of Pakistan raised their eyebrows and dished out the usual threats. One also recalls that the horrific terrorist attack on Mumbai on 26/11 2008 took place when the process of peace between India and Pakistan was to pick up. The correlation between the steps of Indo-Pak peace process and attacks of terror, in which the hand of terrorist groups, who have their support from the some army quarters is unmistakable. One also recalls during previous NDA regime when Atal Bihari Vajpayee wanted to initiate the peace with Pakistan and took the friendship bus to Lahore, the then Pakistan army did not welcome it and expressed its reaction by occupying Kargil. Pervez Musharraf was the army Chief at that time. This Kargil occupation by Pakistan army had to be fought by Indian army supported by Clintons’ reprimand to Pakistan to withdraw from Kargil. During my trip I also happened to meet the civic activists who are committed to friendship with India. These activists along with their counter parts in India have been promoting forums like Pak India People’s Forum. They are also promoting peace and are campaigning amongst other issues, for the release of innocent fishermen who get arrested here and there. Currently Nawaz Sharifs’ releasing of the fishermen before his visit to India is a positive gesture towards better relations with India and in turn peaceful South Asia. One also had a chance meeting with those working for and identifying with the work of ‘Aman Ki Asha’, (Hope for Peace) a joint platform of the major Indian daily along with a Pakistan daily. Here in India the major rhetoric against Pakistan is indulged in mainly by BJP, when it is not in power. BJP has a contradictory attitude vis a vis Pakistan. When not in power BJP has been using Pakistan bashing to polarize the Indian society along religious lines. When in power, it offers an olive branch and releases pigeons of peace. 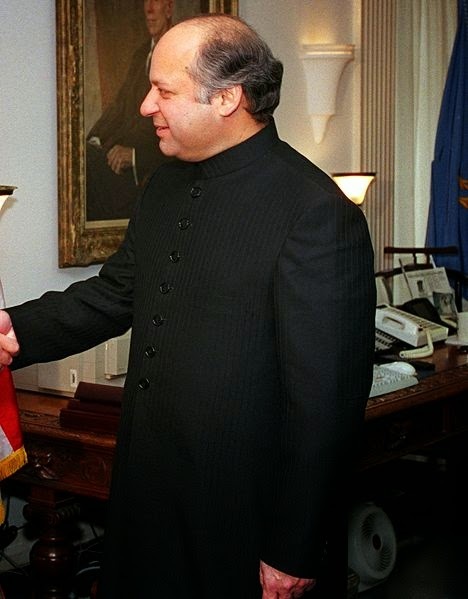 One recalls that our current Prime Minister had brought in polarization in Gujarat after the Godhra tragedy and Gujarat carnage by primarily attacking Pakistan and its President Pervez Musharraf. In the Assembly elections of 2002 the hoardings were having Modi on one side a Musharraf on the other side, as if Modi was fighting elections against Pervez Musharrf. Even during the election campaign of 2014, Modi did resort to menacing gestures towards Pakistan. His party colleague Giriraj Singh was very abusive to Pakistan. Here the ‘social-communal common sense’ is so constructed as if Indian Muslim is loyal to Pakistan, the Indo-Pak cricket matches are seen more as India Pakistan war rather than a sport which should act as a bridge between the countries in a sportsman’s spirit. Irrespective of the fact that it was Madhu Gupta who was caught spying for Pakistan, the major feeling is to suspect every Muslim as a potential Pakistan spy. Our legendary film star, Peshawar born, Dilip Kumar (Yusuf Khan) was humiliated times and over again for his accepting the Pakistan’s highest civilian Award Nishan-e-Pakistan. Rumors against Dilip Kumar were circulating on regular basis. Every skirmish on the border is used to denigrate Pakistan and at the same time criticizing Congress for its ‘soft’ approach to the issues. The anti Pakistan rhetoric is one of the major tools in the hands of BJP, when it is not in power. Its ally Shiv Sena goes one step forward. It has regularly created ruckus on every occasion of Pakistan India interaction. It dug up the pitch on the cricket ground to prevent the match, programs of Pakistan artists are disrupted and even now when Nawaz Sharif decided to come, Shiv sena threatened to boycott the oath taking ceremony. Fortunately wiser counsels prevailed and Shiv Sena chief decided to participate in oath taking same. Unfortunately today in whole of South Asia the religious minorities are going through a rough weather, Christians and Hindus in Pakistan, Hindus and Muslims in India, Hindus and Buddhists in Bangla desh are facing constant violence and intimidations of other types. The violation of the rights of minorities needs to be halted through mutual talks and cooperation. The atrocities on minorities in one country cannot be undone by doing atrocities on the other ones in other country. Every innocent person irrespective of her faith has a full right to follow one’s faith. This can be a major agenda to be taken up by SAARC countries in the times to come. Peace and reconciliation amongst communities has to be brought in, this is the pre-requisite for growth and development. As far as Pakistan is concerned, more the democracy becomes strong there; the hold of army may weaken and peace process will become stronger. Strength of stranglehold of army in Pakistan is inversely proportional to health of democracy and friendship with India. While in India the democratic ground is stronger, a positive attitude to the democratic Government of Pakistan will empower it vis a vis the feudal-army-mullah forces there, in turn strengthening the peace and making us focus more on basic needs of the people related to health, nutrition, education, employment rather than increasing the defense budget. It will help us to focus more on bread and butter rather than on guns and ammunition.